Ah, yes, the blues. There’s nothing quite like it. No other music genre is made up of so many different styles, but still maintains such a distinct sound and feel. Even the best songwriters might have a hard time putting a finger on what makes up the blues but they know it when you hear it. “It just sounds like the blues, man.” And although blues music is mostly based on feel, there are a few steps you can take to craft songs like the top blues songwriters. So if you want your blues tunes to sound like the real thing, read on. One of the best ways to learn about the blues is by listening to the blues and studying the songs written by the legends. It’s hard not to be inspired by blues greats like B.B. King, Muddy Waters, Etta James, and Stevie Ray Vaughan, whose songs have not only stood the test of time but have also defined the genre. Respect the legends but also pay attention to who’s making a name for themselves in the world of modern blues. Study up and coming artists such as Joanne Shaw Taylor, Shemekia Copeland, and Joe Bonamassa to hear what they’re doing to stand out from the rest. If you want to get good at writing the blues, take the time to dissect the work of artists old and new. Learn how to innovate new trends in blues music while at the same time honoring the blues’ storied history. As they say, you need to learn the rules before you break them. More than any other genre, blues music is often defined by the way it feels and the way it makes us feel. The blues has to come from a real place. You can’t phone it in. It’s not easy, but challenge yourself to channel the soul of the blues by getting in touch with your emotions. Make the listener feel what you’re feeling through your guitar, bass, piano or pencil. Whether you write lyrics or music or both, writing a blues song is much more instinctual than academic. The more you listen, practice and perform, the easier it will get to channel your inner blues. Many people think all blues songs are sad. But there are plenty of blues songs that have happy, or even angry lyrics! It just goes to show you that you don’t need to stick to one lyrical style to be a great blues songwriter. It might have more to do with how the lyrics are sung rather than what they say. You’ll find that most classic blues songs use the “AAB” bar structure. In this structure, the first line is sung over the first four bars. The second line then repeats the first line over the next four bars. Finally, the third line is drawn out over the remaining bars. Fun fact: the reason for the repetitive first two lines is mainly due to classic blues writers making up their lyrics on the spot! Repeating the first line gave them time to think up what would come next. Another pattern you might recognize is what’s commonly known as a “12 bar blues” chord progression, which was first codified by W.C. Handy, the Father of the Blues. Go on, look it up and listen to it – we guarantee you’ll recognize it! Practice writing your own 12 bar blues. It’s fun! As we said before, the best way to “feel” the blues is to learn to recognize what it sounds like and how it feels when you play it. 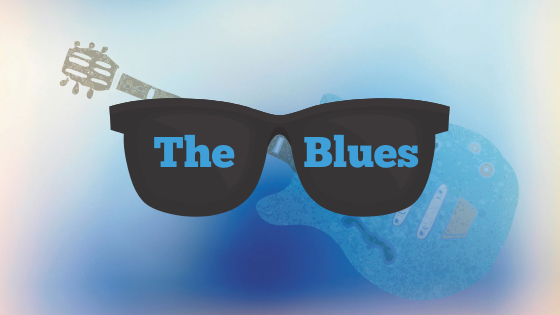 Learn some popular blues songs, or songs from artists you admire, and use what you learn to forge your own style. Then try writing your own blues songs! Who’s your favorite songwriter? Leave us your comments.